Similarly to people, dogs are now living much longer than they used to in the past. Thanks to advances made in preventative medicine, nutrition and disease diagnostics, veterinarians are able to treat medical problems that they were rarely able to treat until now. However, the one disease that your local veterinarian still sees more than any other is oral disease due to poor dental care for pets. Canine dental care is provided at Anchor Animal Hospital in Dartmouth, Massachusetts and has been proven to take address a lot of serious issues, such as oral disease and tooth decay, as well as pet owner approved conditions, such as bad breath in dogs. It is a good idea to provide your furry friends with good dental care, both at home and professional through your South Coast veterinarian. Unlike people, dogs rarely get cavities, but they are prone to gum disease and an excessive build up of tartar and plaque on the teeth. Plaque is formed by the collection of food particles and bacteria along the gumline. A good home care routine and regular check-ups by your veterinarian of dental care for pets can help to remove the plaque and prevent serious damage and disease from occurring. 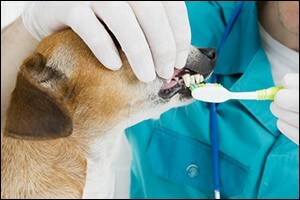 There are two primary reasons why you should get canine dental care for your furry friend. Outside of regular teeth cleanings to help cure bad breath in dogs, there are many other major health benefits to getting at least annual dental care for pets at your South Coast veterinarian. TARTAR REMOVAL – Believe it or not, tartar is where all of the most common issues with pet dental care begins. If the plaque is not removed from your pet’s teeth, then the minerals that are present within the saliva will combine with plaque to form tartar. Also known as “calculus” because of the calcifying properties of this substance, tartar sticks very strongly to your pet’s teeth. It only takes about three to five days for the tartar to form after the plaque begins to mineralize. Tartar is very irritating to the gums and is what causes gingivitis, which is an inflammation of the gums. You might notice a reddening of the gums, especially right next to the teeth. This is the leading cause of bad breath in dogs and cats. Once the tartar is formed, it can take special instruments at your South Coast veterinarian office to remove it and polish your dog’s teeth. This is why it is important to have a good oral hygiene routine at home with regular brushing and cleaning in between professional visits for canine dental care. PERIODONTAL DISEASE – Unfortunately, the situation only gets worse from there. Plaque mineralizes and forms tartar and, if the tartar is not removed, it can begin to build up underneath your dog’s gums. This build up begins to create a separation between the teeth and the gums to form pockets of bacterial growth and even more tartar build up and gingivitis. Again, the more that this happens, the more you will notice bad breath in dogs because of all the bacteria and build up. Once the dental care for pets reaches this point, the damage can be irreversible and can be diagnosed as periodontal disease, which can be very painful for your pet. Not only is it painful, but it can lead to tooth loss, bone loss, infections and abscesses. As bacterial growth continues, your pet may have bacteria enter the bloodstream, which can lead to infections of internal organs, such as the kidneys, liver and heart valves. Periodontal disease can be slowed or stopped if treated by special procedures that are performed by your South Coast veterinarian. This is why good dental care for pets is so important. Once you decide to get your pet on the path to healthy canine dental care, there are a few things that you should expect. Bringing your pet to the vet for regular check-ups is one thing, but including an oral exam and veterinary dental cleaning is another. Make sure to work with your veterinary office to schedule general health exams and dental exams in the same visit whenever possible and get on a regular routine. Daily dental care at home, which can include tooth brushing and home inspections, should also be performed. Your vet will show you how to do a proper at-home cleaning and will tell you what to look for to get good oral health for your furry friend. In most cases, your dog will need to be anesthetized for a routine dental cleaning. This will allow the South Coast veterinarian to take x-rays to assess the overall health of the mouth, flush the mouth to kill bacteria, utilize ultrasonic and handheld scalers to de-scale or remove the tartar build up from the mouth. Even dogs who are great for canine dental care at home will still need to be anesthetized at the vet’s office to ensure that all of these treatments can be done effectively. The teeth will be polished to remove scratches, which can invite plaque and bacteria to take hold. In some cases, a dental solution can be applied to help reduce plaque build up and make future cleanings easier on your pet. To find out more about canine dental care with your South Coast veterinarian at Anchor Animal Hospital in Dartmouth, Massachusetts, give us a call at 508-996-3731. Our team will be happy to answer any questions you have about dental care for pets, from bad breath in dogs to annual cleanings and treatments. Call us today to schedule a well check-up or dental check-up for your favorite dog or cat.